These cakes should be eaten warm from the oven. Even though they’re perfect for dunking — especially in tea — they can lose some of their appeal overnight. Refresh them in a warm oven for 10 minutes. 1. Position the rack in the middle of the oven and crank the heat to 400°F (200°C). 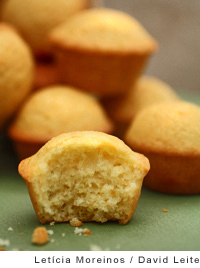 Brush two 12-well mini-muffin tins (1 3/4-by-7/8-inch) with butter. Set aside. 2. Heat the milk and butter in a small saucepan over low heat until the butter is melted. Remove the pan from the stove and let the mixture cool until warm. 3. In a large bowl, rub the lemon and orange zests into the sugar with your fingers until fragrant. Dump in the flour, baking powder, and salt and whisk to combine. 4. Stir the egg, yolk, and vanilla into the warm milk mixture and then pour it into the flour mixture in several additions, stirring gently until the ingredients are just incorporated and the batter is smooth. 5. Spoon the batter into the prepared pans, three-quarters full. Bake until the cakes are well-risen and golden brown, 18 to 20 minutes. Transfer the pans to a rack, cool for 5 minutes, and then pop out the cakes. Serve warm piled high in a napkin-lined basket. One word: yummy! I love citrus, and this recipe didn’t disappoint. These cakes were quick and easy, and didn’t call for any unusual ingredients or require any special equipment. I used one of my 24 cup mini-muffin tins and my #70 cookie scoop to fill the cups. I slightly mounded the dough and it was the perfect amount to fill my pan. My cakes were done at 18 minutes, and after cooling for 5 minutes, they came right out of the pan. The crunchy edges and light but distinct citrus flavor was just right. I’ll be making this recipe again. Portuguese Mini Lemon-Orange Cakes Recipe © 2009 David Leite. Photo © 2009 Leticia Moreinos. All rights reserved. All recipes and photos used with permission of the publisher.